I hope you’re all aware that the big event this weekend is the Walker Cup, the biennial match between the male amateurs of the United States and Great Britain and Ireland. 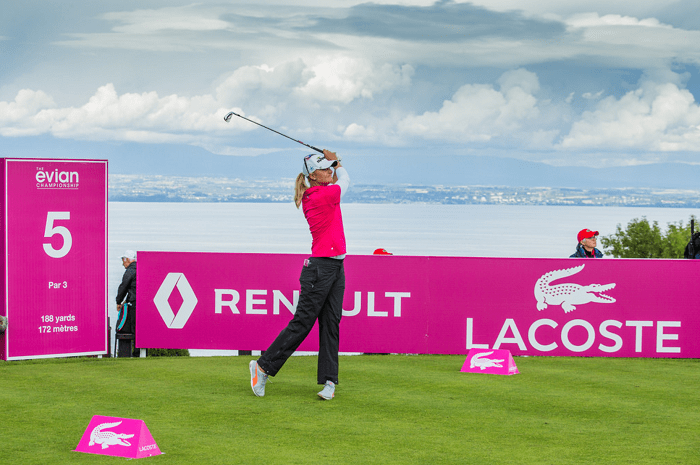 It’s team match play, the best form of the game and is quaintly old-fashioned in that it’s still over two days, foursomes and singles each day – no fourballs, unlike the Curtis, Solheim and Ryder Cups. There are 26 points on offer, with four foursomes each day, eight singles on the first day and ten on Sunday, the second and last day. 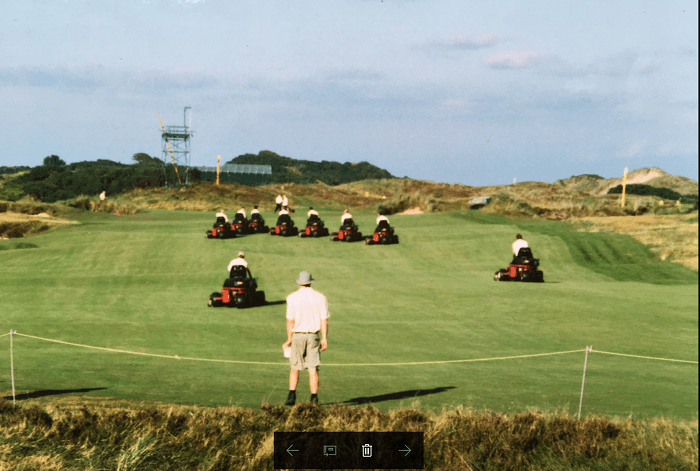 GB&I won at Royal Lytham & St Annes two years ago but it’s a big ask to win in the US – we managed it in 1989, at Peachtree and in 2001 at Ocean Forest but that’s it. Take us out of Georgia and we struggle. This year the match is in California for only the second time, at Los Angeles Country Club, Beverly Hills way, a venue that’s about as far removed from your local muni as you can get. Funnily enough, the last time the match was in the Golden State, at Cypress Point, in 1981, I was there and I hope to be there again in 2023, when one of the most exclusive clubs anywhere has agreed to host the match again. It’s well worth the detour, a spectacular venue just along the coast from its brasher neighbour Pebble Beach, with the par three 16th ranking as one of the world’s most stunning holes. Look up the 16th, ice plant, Porky Oliver and Sandy Tatum and you’ll learn a lot about the place. 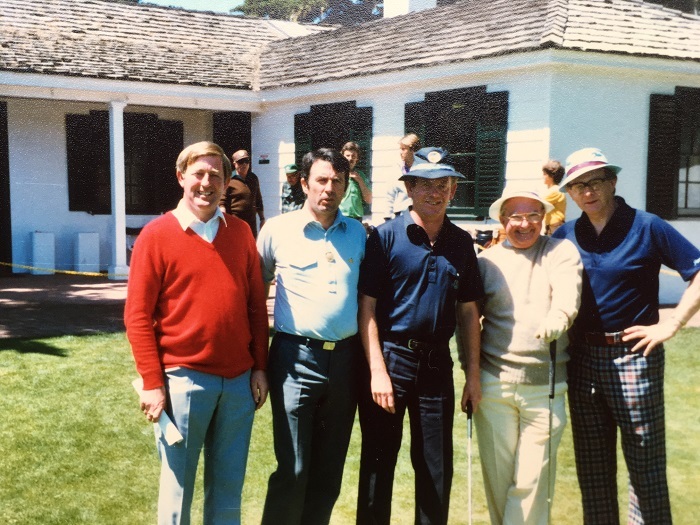 Rodney Foster, Michael McDonnell, Michael Williams, Bob Sommers and Jack Magowan at Cypress Point for the Walker Cup in 1981, four writers, one golfer! A lot of Walker Cuppers go on to stellar professional careers, so these days few of them stay amateur for long – although Padraig Harrington, always marching to the beat of his own singular drum, played in three matches. 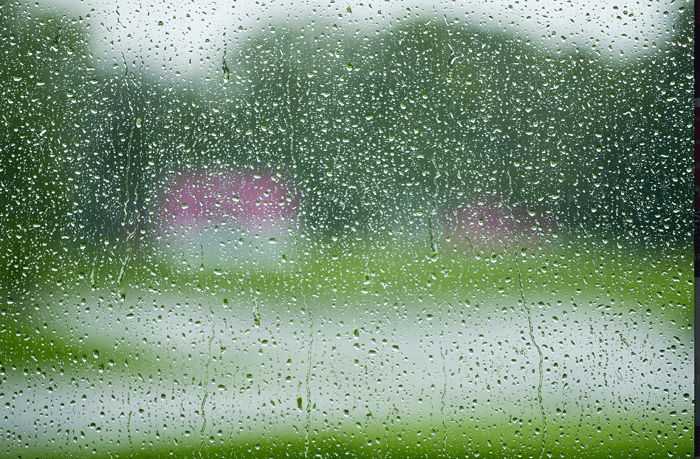 Tiger Woods looked as though he hated Royal Porthcawl, with good reason: it rained most of the time, the Americans lost, he was beaten by Gary Wolstenholme, a mismatch if ever there was one and a decent hamburger was hard to find. Two years later, in 1997, Woods won the Masters by 12 shots, his first of 14 major championship victories. Funny old game golf. Keep an eye on this year’s players because some of them will undoubtedly go on to greater things. Rory McIlroy and Rickie Fowler are just two of today’s stars who played in the match at Royal County Down in 2007; Jordan Spieth was at Royal Aberdeen; Luke Donald and Paul Casey starred at Nairn; and the list goes on. Lifetime amateurs like Michael Bonallack, Joe Carr, Bill Campbell, Charlie Yates, Cecil Ewing and Peter McEvoy, to name just a few, worked tirelessly for the good of golf in one capacity or another and it was thanks to the Walker Cup that I learned about Ronnie White, a Lancashire solicitor who worked hard at his golf – and fitness – but fitted it all in around his work. Still, in five appearances, from 1947-1955, he won four of his singles and in the foursomes was a wonderful foil for Carr, a more flamboyant character but an equally ferocious competitor. White was known as “One Height” because of his ability to keep the ball low, boring it into the winds he encountered on courses like Wallasey, Birkdale and Hoylake. I’d love to have seen him play. Attention to detail: Walker Cup preparations at Royal County Down in 2007. Things were a bit grey in the UK after World War II so the LA of today would be like another planet and it would be interesting to know what the courtesy cars were like in the late 1940s and early 1950s. Nigel Edwards, a former Walker Cup player and captain, who is now (as a Welshman) director of coaching at England Golf, posted this photo of his courtesy car this week on Twitter. Who could resist tweeting such a treat? Let’s hope the match is as eye-catching. 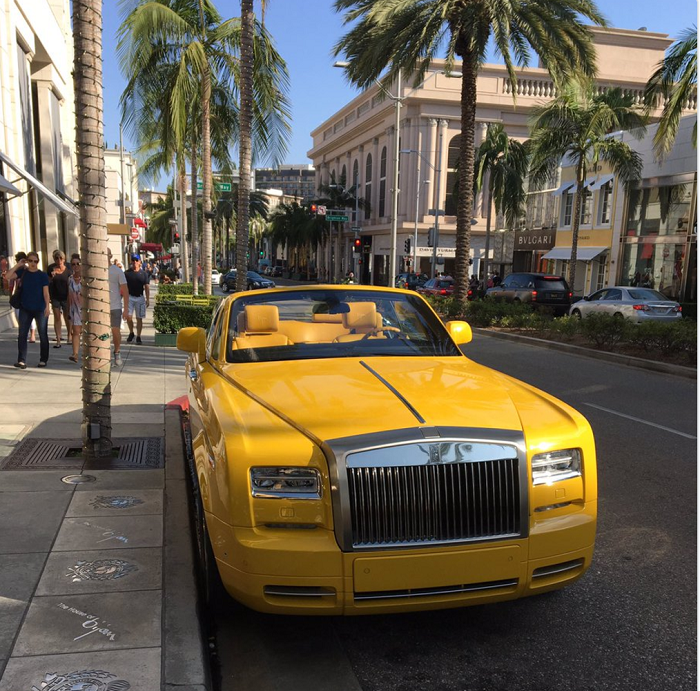 If you’re going to drive in LA, this yellow peril is just the job. Note the matching upholstery. Attention to detail. The 15th edition of the Solheim Cup begins today at Des Moines Golf and Country Club in Iowa and record crowds are expected – proper Ryder Cup-sized crowds of over 25,000 fans per day. It’s a far cry today from the first playing of the event at Lake Nona in internet-less 1990 when the match wasn’t televised, yet founder Karsten Solheim was astute enough to have an hour-long highlights film made. Since then the match has followed a straight line upwards into the stratosphere and between us Patricia and I have been present at 13 of the 14 matches played so far and we’ve witnessed some amazing moments. 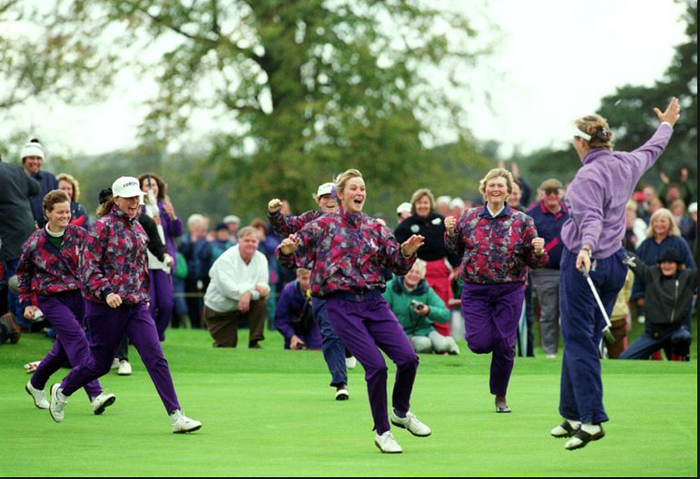 If Lake Nona was the launchpad for the Solheim Cup, the unexpected European victory in 1992 at Dalmahoy was the point the afterburners were switched on. Europe trounced the Americans by a clear five points, the defining moment coming when Sweden’s Catrin Nilsmark, at that time a total unknown to the US team – not even being a tournament winner – holed a 4-footer on the 16th green to beat Meg Mallon, winner of two majors the previous year. The might of the 10-woman American team with a haul of 23 majors between them had been scuppered by the Europeans who could collectively muster only two. I was at the back of that 16th green when the golf world was turned upside down and the home team and supporters jumped skywards. This was one of the finest sporting achievements I was privileged enough to see and they were my friends and my colleagues who’d delivered – I couldn’t have been prouder or happier and I suppose that’s really when my Solheim love affair began. Catrin Nilsmark (right) and her team mates leap into the history books. The pull of the Solheim was even strong enough to make my mother board a transatlantic flight for the first time at the age of 78 despite a pathological fear of flying. When a big family-and-friends trip to Muirfield Village for the 1998 Solheim Cup was being mooted, she was certainly not going to miss out on all the fun. 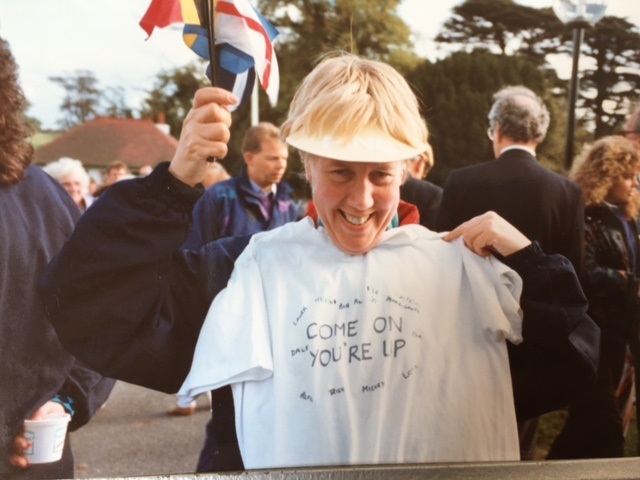 She had been present at Dalmahoy and then at St Pierre in 1996 but this was her first away match and she and her pal from Cork, Brid O’Sullivan, were determined to make the most of it. They even brought their clubs along and enjoyed a week’s golf at Pinehurst after the match. Before that, however, Brid took a tumble out on the course, banging her head in the process and that was enough for the wonderful American and Muirfield Village hospitality to kick in. She was furnished with a clubhouse pass for the remainder of the match once it became apparent that she should not be out battling the crowds and nothing was too much trouble for our hosts. It’s not just the match that makes me love the Solheim Cup. Brid (left) none the worse for her tumble and Mum (right) mulling over the European loss in 1998. In 2009 and 2011 I was a small part of the European backroom team for captain Alison Nicholas, helping the players deal with all their media requirements leading up to the matches. This has to be tightly controlled otherwise it becomes difficult for them to focus on the main job of practice and preparation as so many people want a piece of them. With Alison Nicholas, winning Solheim Cup player and captain. For me, it was the 2011 match at Killeen Castle that provided the most exciting and thrilling finish of all. Rain delays had halted the singles and by the time there were only four games left on the course the Americans were 12.5 to 11.5 ahead and in front in three of those games. To say it didn’t look good was putting it mildly. Christel Boeljon of Belgium raised our hopes with a final green victory over Brittany Lincicome to level the match score and with Suzann Pettersen producing the form of her life to finish with three consecutive birdies to defeat Michelle Wie on the 18th the home supporters were beside themselves. That meant Europe led by 13.5 to 12.5, so when Aza Munoz went dormie after 17 we knew we couldn’t lose. But that wasn’t enough for the Europeans. They had lost the last three Cups and they wanted victory outright. Somehow, Caroline Hedwall, coming up the last one down, magically conjured up a half against unbeaten rookie Ryann O’Toole. The magic 14.5 points were assured but turned into a final 15-13 scoreline when Aza also won on the last. My lasting memory of that Solheim Cup was the high speed journey back to the hotel on the team bus, music turned up to full volume, escorted by police motorcycle outriders clearing the road ahead for us. The hotel staff were all outside the door waiting to applaud the players in and, as you can imagine, headlong into a night-long party. What else do I love about the Solheim Cup? The unique first tee singing by the two sets of fans, inspired by Sue Pidgeon and Angie Bell, amongst others, with the Spontaneous Orpheus choir (which was small but quite organised) setting the tone at St Pierre in 1998. The Europeans distributed song sheets and had different songs to welcome the players onto the tee. It took the Americans a few years to cease to be a little bemused by it but now they enter into the spirit of it all with glee. It’s even caught on in the Ryder Cup as well. So many special moments, including our first (and, at the moment, only) win on US soil in Colorado in 2013. Let’s not forget, either, the sparky little controversies down the years that have added that extra bit of spice to it all. So, no prizes for guessing where I’m spending today, Saturday and Sunday. The computer will be switched off and so will the phone. Don’t call me, I’ll call you. Vamos Europe! I’ve had a pretty hectic, but hugely enjoyable, week in St Andrews and I’ve now tumbled straight into another six non-stop days of action, researching and then commentating – from the BBC studios in Salford – on the USPGA at Quail Hollow, in Charlotte, North Carolina. 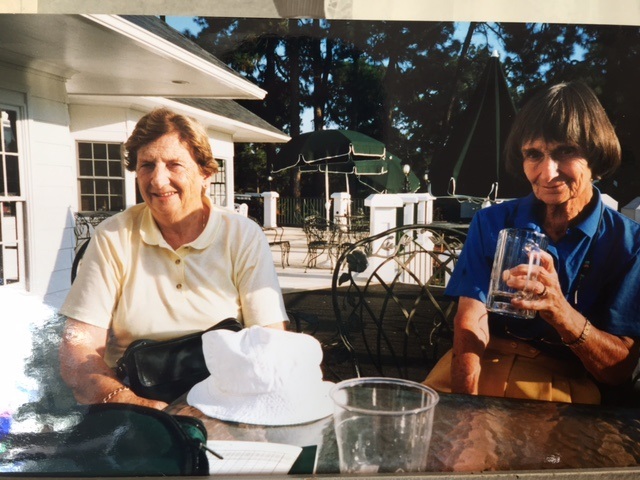 I did ask Patricia to write my blog piece this week as well as her own, but she didn’t even pause to consider that suggestion – too much golf to play and happy retirement hours to fill, I suspect. Even I relish the occasional escape from the wall-to-wall golf that makes up my existence at this time of year. So, it was a delightful start to my week in Scotland to catch up with an old schoolfriend Tricia McIntosh, and some of her family in Linlithgow. Refreshingly non-golfy, Tricia is diving headlong into her own new and exciting world of retirement and, despite loving her teaching job of some 35 years, she has found no need to cast long, yearning backward glances. Hmm, wonder if there’s something in this retirement lark after all? 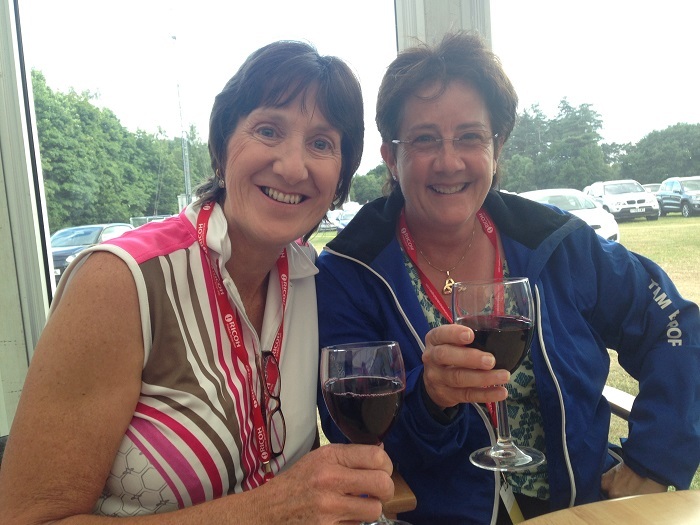 On to St Andrews for the Ricoh Women’s British Open (RWBO) and another catch-up, this time with an old university pal, Kathy Christie. We met on our first day at St Andrews University and Cathy and her hubby have now settled back in the auld grey toon so proving that some of the residents of this epicentre of golf can, in fact, exist quite happily without pursuing a little ball over miles of rolling terrain. Her big news? Why, she’s retired, of course! And loving it. Doesn’t understand how she’d time to work etc etc. Note to self: after the USPGA this week, investigate this happy-clappy retirement land that now seems to be peopled with ridiculously fresh-faced friends of mine who have parked all stress and appear reinvigorated, re-energised……and busy! The Beeb were doing the highlights of the RWBO and it’s never a dull week when you share it with Peter Alliss and Ken Brown. 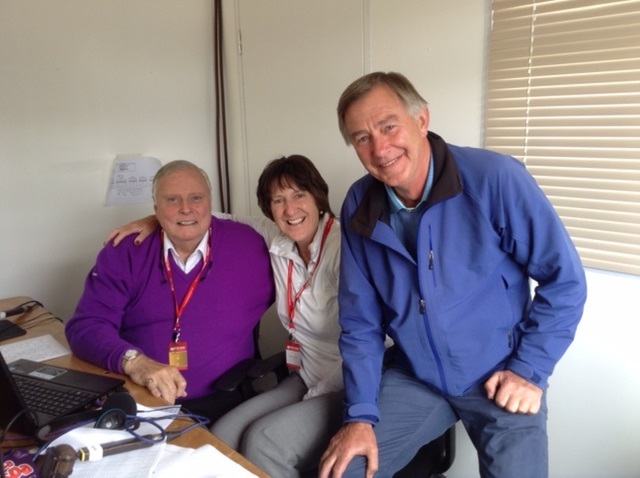 Over twenty years of commentating with Peter Alliss, left, and Ken Brown, right. Kingsbarns provided a visual feast, the golf was outstanding despite the indifferent weather and the players were, as always, very approachable and accommodating with their time. Ricoh did a splendid job and all were warmly welcomed by the Scottish galleries. Was I the only one, however, who chuckled at the irony of the parting admonition to the players to “Haste ye back”? Nothing approaching “haste” was spotted during the playing of the championship, so a black mark must go to those officials tasked with endless timings which resulted in zero action. Let’s leave that discussion to another day. 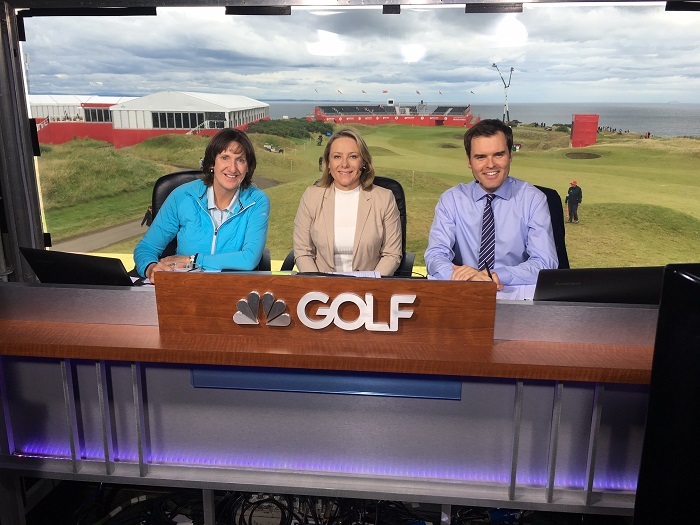 On each of the first two days I also did an hour in the booth (American for commentary box) for The Golf Channel alongside former Women’s British Open champion, Karen Stupples, and Tom Abbott, a veritable walking encyclopedia on women’s golf. Their modus operandi is totally different from that of the BBC where the commentary is specifically about the actual golf being played with snippets of info about the players and course. The Golf Channel comment mostly on the players, the course and topics of interest like the Solheim Cup team selections with occasional reference to the golf on the screen. Two entirely different ways of delivering the same product. My Golf Channel debut with Karen Stupples and Tom Abbott, generous colleagues. The Solheim Cup thread, of course, was of huge interest all week. My great pal Marta Dotti, coach supreme, is one of Annika Sorenstam’s vice captains and along with Maria McBride (aka Mimi Hjorth) and Catriona Matthew was working hard, crunching the numbers and stats to select the best possible European team. We did manage a couple of coffees in between the showers and work commitments, however – another great catch-up with a pal. I also had a little chat with the US captain Juli Inkster one morning in my hotel where she was having breakfast with some of her backroom team. Despite looking calm she didn’t seem convinced when I suggested she’d such an array of talent to choose from that she could hardly go wrong with her captain’s picks! Always easy from the outside looking in. 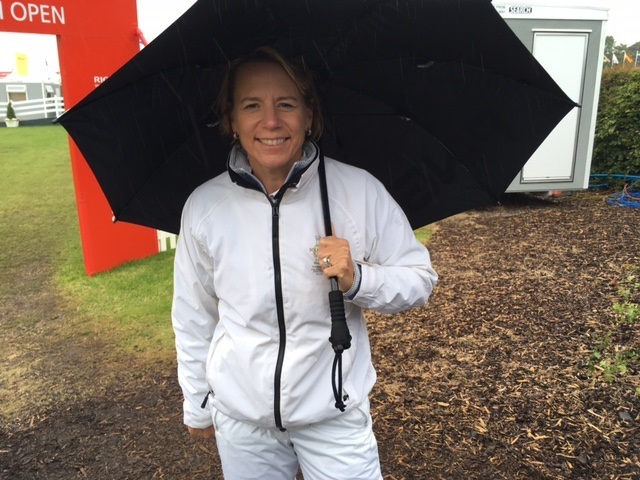 Will Annika be smiling after the Solheim Cup, I wonder? 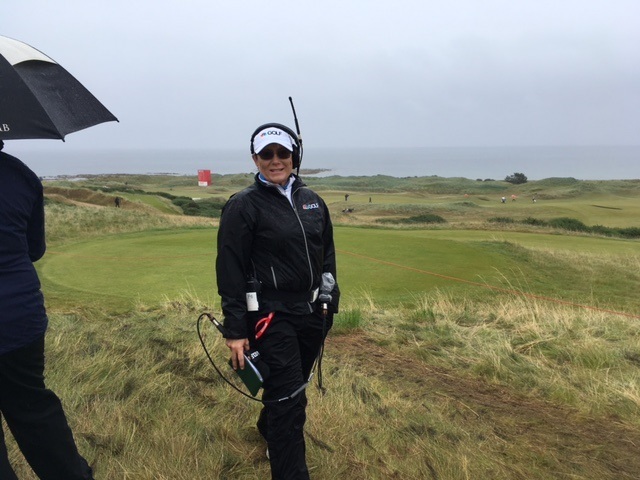 Still the best – Karen Stupples is smiling (just) in the rain as IK Kim, the 2017 RWBO champion, finishes one shy of the Englishwoman’s record-breaking 19 under par total. 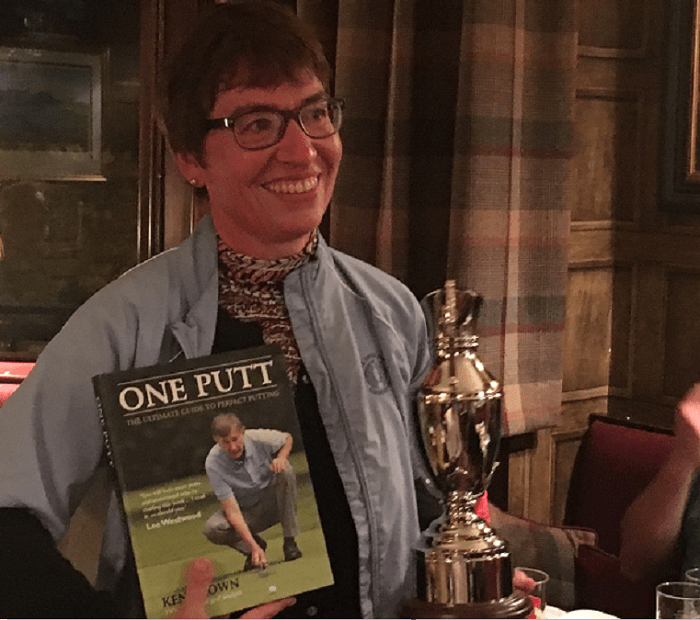 The week was rounded out with a little farewell party for the Beeb’s outstanding Golf Editor, Kate McKeag, who has been with them for around thirty years. The freelance world is beckoning and I just hope she keeps some golf in her impressive portfolio so I have the opportunity of working with her in the future. But wait….it was only at the start of this piece that I thought retirement sounded SO attractive and that last sentence would suggest my subconscious thinks otherwise. But then, swanning around all over the place watching golf can hardly be called work, can it? Kate, armed with her very own Claret Jug and putting advice from Ken on the Course.